Nairobi, 15 August 2002 — The Kenya Coalition for Access to Essential Medicines welcomes the decision by the Kenyan parliament to reverse an amendment to the Industrial Property Act that blocked commercial importation of cheaper medicines. The re-amendment was tagged to a Trade Marks Amendment Bill and was passed by Parliament last Thursday. "This is great news for all Kenyans! We hope that this means that soon cheaper antiretroviral drugs (ARVs) of the same quality and a wider choice will be available, so that many more people living with Aids will have access to them," said Liza Kimbo, a Coalition member. The change makes it possible for 'generic' drugs to be imported into Kenya. Generic drugs are exact copies of medicines that are under patent protection. According to the latest regulations under the World Trade Organisation (WTO), patent rights for medicines can be waived in cases of national emergencies, like the AIDS pandemic in Kenya, to make the use of cheaper generics possible. In July last year, Kenya adopted an intellectual-property law - the IP Act - according to the new WTO regulations. 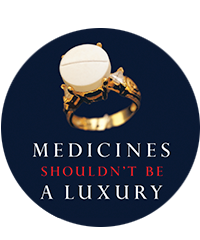 The IP Act made it possible to shop for the cheapest medicines on the legally market anywhere in the world. This provision in the law was however changed in June this year, requiring potential importers or producers of generics to seek explicit permission from the patent holder. As it is against the patent holder's interest to grant such permission, the change in the law practically made it impossible to make the cheaper, equal-quality medicines available to Kenyans. With Thursday's decision in Parliament, the IP Act has been restored to it's original version. The Bill now awaits Presidential assent before it will come into force. The Coalition would like to thank everybody who was involved in the efforts to change back to law, notably Honerable Nicholas Biwott, Honourable Sam Ongeri, Honourable Newton Kulundu, Honourable Norman Nyagah and the Kenya Industrial Property Institute. However, Coalition members point out that there are still other barriers to the wide use of cheaper ARVs in Kenya. Most of the generic medicines await registration by the Kenyan regulatory authority, the Pharmacy and Poisons Board, even though manufacturers applied for such registration a long time ago, dating back to 1999. "The Board is very slow in giving permission for the use of these drugs in Kenya. Only three generic ARVs have been approved so far, but these three cannot be combined into one triple-therapy. For bureacratic reasons Kenyans are still waiting for these drugs. The registrations are not handled with the urgency that the situation requires," said Dr. Chris Ouma, another Coalition member. The Kenya Coalition for Access to Essential Medicines is made up ActionAid Kenya, Cry for the World Foundation, The Association of People living with AIDS in Kenya (TAPWAK), Network for People living with AIDS (NEPHAK), Ecumenical Pharmaceutical Network (EPN), Médecins Sans Frontières (MSF), Women fighting AIDS in Kenya (WOFAK), the Society for Women and AIDS in Kenya (SWAK), Health Action International (HAI) Africa, Nyumbani orphanage, International Federation of Women Lawyers - Kenya (FIDA), DACASA, the Kenyan Medical Association (KMA), and Consumers Information Network (CIN), and others, as well as many individuals.